Forgive me if I get sentimental. Forgive me if I wax poor poetic of a weekend that was full, filled to the brim leaving me with less than adequate amounts of sleep, full of beautiful people whose beauty comes not from runway looks but from good hearts, full of beautiful pens and beautiful inks, full of laughter and joy, full of many things that we seek in life: friendship, community, leisure, joy, generosity, kindness, mutual benevolence. I came away from the nation's capital filled with hope, which is itself a gift. This may seem an odd, and terribly sentimental, response to a pen show. I left full after spending three days around writing instruments and paraphernalia? To capture why I feel this way would be difficult. And, although I have been bereft of words on the blog for many months, I will try to paint cabinet pictures to welcome you into why it is I feel this way. Our fellowship started small, Lisa Vanness, her daughter, Cassie, and myself. Through rain and through mountains we traveled. Being from the swamps of South Louisiana, anything resembling hills is impressive to me. Traveling through mountains for an extended period of time always garners images of Aragon, Legolas and Gimli hunting down the Urukai in The Two Towers. Tennessee and Virginia still maintained lush greens in the height of summer. Rolling foothills of Sailor Bungbox Norwegian Wood and Caran d'Ache Delicate Green meeting the Visconti Turquoise sky made most of our drive a pleasure. Even when the skies darkened to Iroshizuku Kiri-Same or the lighter shades of Perle Noire, the mountains pushed through as immovable forces fighting against the falling rain. After hours amidst the Shenandoahs we greeted the new lining of the highways, stone, metal, and glass of the DC suburbs, if only because they announced a coming end to our journey. We arrived to a show already abuzz with traders and some familiar faces. We didn't spend much time catching up as we took the metro out to DC proper to tour museums. The rest and relative quiet was an intentional calm before the storm. I spent my three hours amidst the tempura pain of the late Medieval and early Renaissance paintings of Italy. The blues of the Madonna and the reds of the Crucified Christ still stand out in my mind. By the time we arrived back, the fellowship was completed by Brad Dowdy, Ana Reinert, and Matt Armstrong. Friday morning came and our crew of bloggers and Vanness assembled to peddle pens and ink. Being familiar with most of the pens and at least some of the ink I found it easy to slip into salesman. Matt and Ana, the ink experts, spend their time helping match inks to pens or shades to inks. Ana with her bright pink hair and Matt with short almost imperceptible blonde hair navigated well the seas of magenta, blue/black, and sepia guiding ink-farers by their lighthouses to the safe shores of Akkerman and KWZ. Lisa flitted around lending her expertise to wherever it was needed. Brad and I found ourselves, most often, trying to sell pens people picked up but didn't care to buy. Cassie often enough became the exchequer ensuring proper funds were exchanged. All weekend there was a conviviality about our lovely band of misfits. Despite the long days and constant stream of customers, we were jovial. We were content being at a pen show, surrounded by the people and things we love. Because of the busyness of the table, we all didn't have much time to go shopping. This made it a very different show. It wasn't about the deep search and find for a gem. This show is made for this particular type of shopping because there are so many pens. I came having preordered two pens and having two more on my shopping list. I preordered the new Visconti Homo Sapiens London Fog from Chatterly Luxuries. I chose a broad nib when I picked it up. I also preordered a blue Aurora Optima from Dan Smith who ground a fine architect on the nib. Both are gorgeous pens. I also reserved a bottle of Lamy Dark Lilac from Vanness. There were two surprises on Friday. Franklin-Christoph has made a name for themselves at the beginning of shows by having prototype materials; that is now an expected at every show. The buzz was immediate when everyone heard Kobe-Nagasawa had brought their full line of ink. Their popular inks went in the first day. I was able to pick up #32 Tamon Purple Gray to add a second bottle of purple to my DC collection. The second surprise came from the debut pen company, Kanilea Pen Co. They represent a step forward in this continued movement in small American pen makers. Edison Pen Company and Franklin-Christoph started a new trend using great nibs and beautiful materials. They've gone a step farther by providing a story and meaning for each material used. They provide a few different body styles. They have a fantastic logo. They did it all right. Some of the most sought after pens of Friday, their stock was widdled down after one day. It will be interesting and exciting to see how they move from here. Once the Pen Addict talked about them on Wednesday, their website was overwhelmed, a good sign indeed. Late in the afternoon, when people had seemed leave to eat or take naps, I took advantage to browse a bit with Thomas Hall. We passed Chatterly and Edison Pen Co. perusing but not committing. It was at this point he asked if I had a shopping list. I had seen a pen in the Atlanta pen show that was an OMAS limited edition commemorating the 50th Anniversary of D-Day. OMAS is know for beautiful simplicity in their pens this one is no different. The same retailer was there at DC, Toys in the Attic. After taking a good look at with Thomas, I couldn't pass it up, It's my favorite of the whole haul. It needed a bit of work which Dan Smith helped with, and it writes wonderfully. What's going on? Where are you from? We're from Canada, the Philippines, and at least a 3rd of the states in the US. We're here for pens. Pens? The bystander pulls a Bic out of her purse, her face contorting in confusion. Her responder pulls out a recent purchase, say the Aurora Optima, More like this. The confusion mixes with wonder as her eyes grow wider. We like to use and collect fountain pens, Aurora held out as a token of honor. But you're all so ... happy. Yes, the pens brought us together, but we have made good friends with our fellow pen addicts. Yearning grows on her face as the fear of looking an outsider fades, Can I join you? Such was the atmosphere that night. In fact, Brad told me one guy arrived that very evening apprehensive at attending his first show. He saw us at tables boldly walked up and introduced himself saying, "You must be here for the pen show." I spent most of the night under the tutelage of Thomas Hall, learning about urushi and how it charges per master using it. I learned about how to search for what you like and pass along what you don't, an idea I am more convicted of leaving DC. 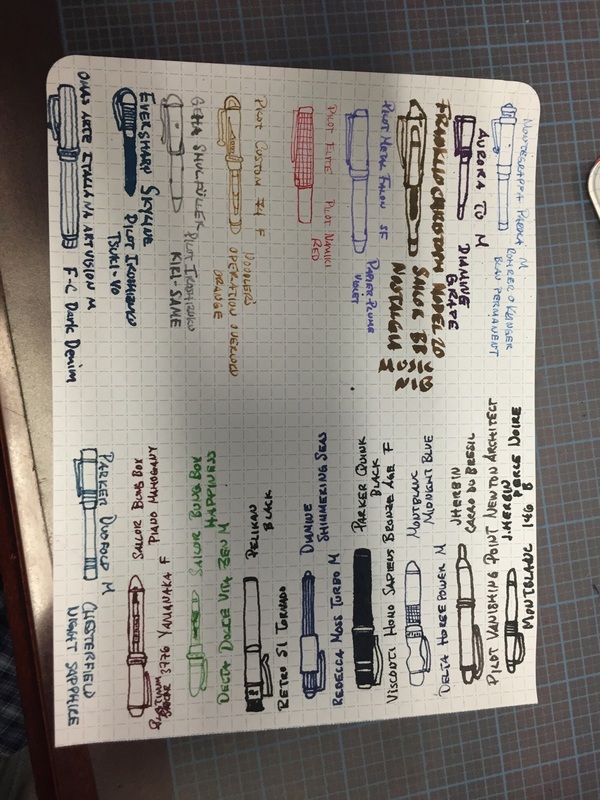 In the midst of the lesson, we dove deep into his collection of TWSBI 580's. Thomas has a large collection of Danitrio and Nakaya and all sorts of fine writing instruments. He loves the 580 body, but he has done brain surgery on them replacing the Jowo nibs for vintage flex. Oh my! Those nibs certainly wouldn't work for my everyday handwriting but neither is does M1000 (a pen quickly moving up the rankings). Stick with what you love is a great model. As I go back home, I'll start looking at what I love and what I don't. Sunday was more restful. It was filled primarily with goodbyes. Many had to get back to work for Monday returning to using their pens in the midst of the digital age. Sunday felt like a day of transition. There's some back door deals between sellers for leftovers, but you can tell everyone is preparing to move on after a frenzy of two and a half days. For some stock has depleted, for others it's disappointingly unchanged. The Vanness table slowed for the first time the whole weekend. Most had gotten the inks they were looking for. Robert Maguire, a Canadian confrere, had generously passed along to me a Shearer Tuckaway with a military clip and faulty filling system. Mike, of Indy-Pen-Dance, coaxed it back to life. My final purchase was one I planned on making. I sat down at the Franklin-Christoph table to look at Jim Rouse's Sheaffer Legacy Fantasy pens. I pulled the whole case to me. At first, I was attracted to the orange material because its vibrancy makes itself known. As I looked through the materials though, I returned to the cracked ice material because there were small shimmers of blue like water bubbling up from rock. I might call it my Meribah pen. As we all parted, Sunday night was bittersweet. We so thoroughly enjoyed ourselves. We enjoyed sharing our mutual love sans much drama, anger, and bitterness many had experienced at previous shows. I really think DC 2016 is a turning point in our community, and my hope is, despite different cultural backgrounds, we grow in unity through our mutual love of pens. 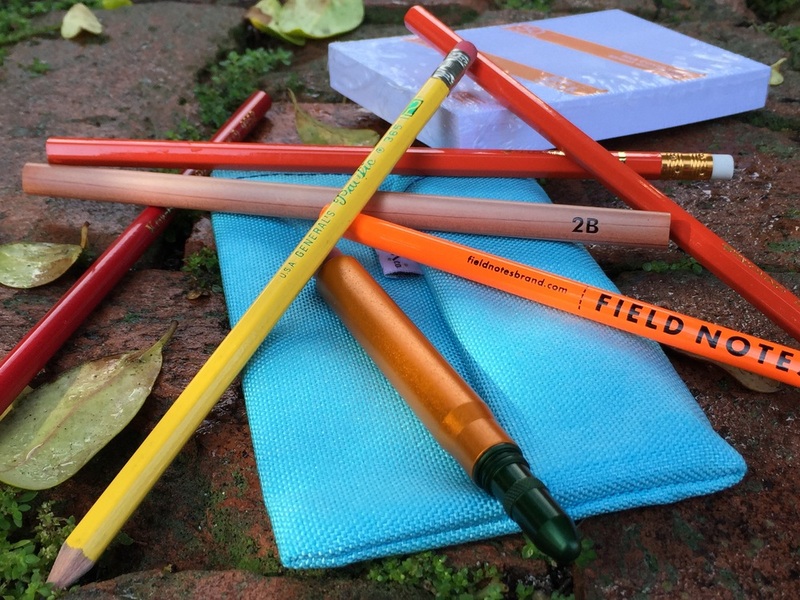 Coming off Lent and Easter, the Atlanta Pen Show is nearly here. And I am unprepared. I psyched myself up for the Arkansas Pen Show a month and a half ago. This is different. My excitement is more muted. I think that will change as the day goes on or on the drive to Atlanta tomrrow. Even now as I hear people arriving, it's growing. Last year, I drove Saturday night and Sunday morning to catch the final hours of the show. It was great to meet so many people, even if they were getting over pen show hangovers and were somewhat out of it, except for Punkey. Punkey seemed to have boundless energy. It was probably that killer coffee he drinks (forgive the public inside jokes). This year will be very different. This year I'm traveling up with my sister, who declares she's not ready for the responsibility of a fountain pen. "So you're saying there's still a chance?!" She's getting married in November. She's my best friend, but our relationship will change once she weds herself to her fiancé. So we're going on a sibling vacation, that starts at the pen show. She'll drop me off at the hotel on Friday and spend the weekend with her friends in Atlanta. She'll come by on Sunday, and I'll introduce her to this awesome subculture, which, at the moment, she finds odd. We'll then spend a few days in Asheville and Savannah. My excitement for the show is somewhat mitigated by my excitement at being able to spend some quality time with my baby sister. As the show approaches (tomorrow! ), my mind is turning more to final preparations: what pens I'm bringing, what's on my shopping list, finalizing my budget (the IRS was not good to me this year). In the process of doing that, I'm also mentally setting up my game plan. Pens: Since this will be the largest group of pen people I'll ever hang with, I figure I'll bring the jewels of my collection, inked up and ready to play with. Having a collection of close to 100 pens is difficult to travel with, so I've chosen my 34 unique or favorite pens, housed in the large Monteverde case. I have four that need work that I'll be bringing as well. On the lookout: I have heard about and seen on eBay a holy water dispenser pen. There are Parker and Sheaffer models I've seen. Right now this is my grail (the irony is not lost on me). Hopefully, I'll be able to see Jim Rouse's, to at least see how they work. I'll be putting the word out that I'm looking. Shawn Newton has been posting some tasty pens on his social media. I will definitely visit him. OMAS will always be on my radar; I've been bitten by the bug. A Nock case might be in my future as well, oh and a Karas Kustoms Fountain K. I know the Franklin-Christoph table will be hopping, but something might tickle my fancy. The most important part of a pen show though is the people, getting to know new people, catching up with friends, having conversations about life, the universe, Nakayas, and everything. Most of the pens available could be bought online (should is another question I will intentionally avoid). The people, the face to face, are what bring the show its flesh; the pens are lagniappe. If not for the men and ever increasing number of women (which is a good thing), a pen show would seem more like a flea market, much product but very little relationship. That's no fun. A pen show isn't a captialistic vaccuum. It's the best part of a garage sale combined with the delight of a family reunion and the niche conversation of a comic book shop. The best part is that are no ludites or Gentiles. Newbies are just as welcome as the veteran (there are always grumpy people, but that isn't the norm). In fact, newbies can have the experience of a baby at the family reunion, being passed around from uncle to great aunt to cousin to learn all the varied stories of the family. My game plan, then, will revolve around the people, my introversion, and the fact that my back is currently spasming. As an introvert, I love those conversation of three or less about something we love. I'll eat up conversation after conversation, and I'll forget to take a break to rest myself. Breaks are of utmost importance for me, for food, for prayer, and for rest. This time away does a few things. It gives me strength and a renewal of energy. It gives perspective to my prospective purachases. It allows me not to get completely overwhelmed and crash exactly when I don't want to. I know many of us are introverted, so heed this advice. It's okay to walk away for an hour. Fear of missing out will be greater than ever at a pen show. Be confident in yourself and walk away so you can recharge. The extroverts will keep talking, keep moving, keep going because they're in an energy feeding frenzy being around so many people. Don't confuse yourself into thinking you can do the same. An hour away here and there will enhance your experience tenfold, especially the late nights. Those who will be there I look forward to meeting or seeing you again. Those who won't be there we'll miss you. Laissez le bon temp rouler. We’re nearly three weeks after the end of the writing frenzy that is International Correspondence Writing Month (INCOWRIMO). INCOWRIMO is where participants write once a day for the 28, or this year 29, days of February. It could be a letter. It could be a postcard. It just happens everyday. I was having a conversation with an online pen friend sometime in February about writing letters. This friend was having a bit of trouble writing letters to near strangers. It felt somewhat uncomfortable. I encouraged her and gave a few insights that have helped me over the last few years as correspondence has become a regular part of my week. I felt that I should share that with you. I remember first writing to someone when I was in kindergarten. She was my best friend, who had moved away because her father was transferred. In the early 90’s, before Facebook or Facetime, my parents suggested I write to her. I admit I didn’t fully understand nor appreciate correspondence at the time. I would write to her; she would write to me. It was a way for both of us to ease the pain of separation. About a year later, the letters stopped as we had moved on into our lives in grammar school. The depth of writing of a five year old was surface level, as I couldn’t communicate much of anything well and could hardly maintain sentence structure, which I’m sure was helped by my mom. Nonetheless, there was a tenderness there between 2 genuine friends. I wrote letters here and there throughout grammar school, high school, and college, but most were formal or classroom related. I wasn’t really interested in corresponding with people, being content with AIM. As I got into reading blogs later in college, early in graduate school, I came across a fascinating blog called Letters of Note. Shawn Usher, the brains behind the blog, would find fascinating correspondence and some history about the chosen letter, then would post pictures of the letters along with his short introduction. They were always fascinating reads. Sometimes they were responses to fan mail from a celebrity, other times they were letters home from war, and still other times they were normal correspondence between friends. Each letter opened a new gateway to looking at history. This concept inspired a graduate school paper for Reformation/Post-Reformation History. I was intrigued with the relationship between St. Thomas More and Desiderius Erasmus. They had met as young men, both intellectuals, one the son of prominent lawyer in London, the other an illegitimate son of a Dutch cleric. More became Chancellor of England before being beheaded for disagreeing with his ruler. Sharing his time between France and Belgium, Erasmus became one of the most prominent Scripture scholars of the century and Martin Luther’s most effective interlocutor. Their friendship was maintained for thirty years primarily through letters. This correspondence was the main content of my research for the paper. I became fascinated with their conversations and how much was revealed through these letters. I poured through well over 100 correspondences and ate up every word. It was through this research I became aware of collections of letters by other of my favorite people in history. I was always on the lookout for epistolary collections when I browsed the shelves of used book stores. I got to see a side of my favorite authors that cannot be seen in a biography. I now have letters from Tolkien to Mark Twain to Mother Teresa. I found their writing styles and the content of their letters an ever deeper experience of human relationships. A few years later I found the joy of fountain pens and the community around them on Instagram. Three weeks after my first pen pic on Insta one of my new pen friends commented on a pic of my currently inked pens, “u should send a letter my way! :)” I must admit I was taken aback. I barely knew this guy other than his taste in pens (Sailor) and his calligraphic skills. I was going to write a letter to someone with whom I had no rapport or intimate knowledge? I knew how emotionally invested a personal letter could be, and I didn’t know if I was ready to engage someone on that level when I knew him only virtually. My heart was reticent. My head, however, recalled the countless letters I had read by various people, some of which had a lower emotional investment than my own Instagram posts. I also recalled the great joy I had when I received a letter from my friend. I was much more invested in my mom’s opening the mailbox because there might be a letter in there, a continuation of the story and conversation.So I listened to my head, not my heart and wrote this random guy a letter. I received one back a few weeks later, and realized quickly how much I enjoy this form of communication. I picked up two more correspondents here, another there. I would keep in touch with the beneficiaries of my giveaways. Before I knew it, there was always a letter sitting at my desk waiting for response. Then, last year I participated in INCOWRIMO, 28 days, 28 letters (and thankfully no zombies). It was at that point, 84 weeks after starting this journey, that I really fell in love with writing letters. I probably wrote letters to 15 new people in that one month, starting 15 new relationships. As an extroverted introvert, that was both exciting and tiring. I loved it, but it was also overwhelming like the first bite of the finest steak you’ve ever eaten. I was stunned into inactivity. Sharing myself in such a way wore me out. I don’t think I wrote another letter till April. Once I did, I knew I had to make correspondence a regular part of my life. It proved a good balance to the instant communication of social media. I now write at least one letter a week. I don’t feel the overwhelming need to respond to a new letter immediately. I wait until I've responded to the ones already sitting, patiently anticipating a response. You might have heard about INCOWRIMO, but were afraid, like me, to take up pen and paper, envelope and stamp to write a letter. That’s understandable. Try it anyway. I have been opened up to a whole new world of experience getting to know people from Australia to Canada to California and beyond (haven’t gotten a letter to the space station yet). I’ve ‘met’ people of vastly different beliefs than me and had civil conversations about those differences along with what we have in common. I’ve made new friends in places I may never go, but hope to. If you are wondering, “I don’t know if I could do this,” either because of the fast pace of your 21st Century life or because you don’t want to write to someone whom you can’t yet trust. I encourage you take up and read. Find a collection of letters from your favorite dead author (usually live ones won’t give over their letter for publication). If you don’t have a favorite dead author (email me, I’d love to introduce you to a few), do not fear. Sean Usher, of Letters of Note, has published a book version of his blog, a compilation of unique and powerful and easily accessible to every reader. Pick it up. Read. Learn, there are few greater joys than to know someone took the time to hand write you a letter. Thank everyone for entering the giveaway! It's finally gotten cold down here. The winner is HilaryAnn Golden! Congrats Hilary please email me up top for your address. Unlike many of you who live up North, fall has only just begun in South Louisiana, just after the official start of ’winter.’ Leaves are turning colors and temperatures are dropping below 70°, sometimes. Laugh or cry you may but our winter is your fall. Now this weather gets me in a sentimental and reflective mood. I’ve come a long way over the course of this year in my relationship with woodcased pencils. At the beginning of the year, if you would’ve told I’d traveling to my year end retreat with a 2B triangular pencil and a pencil encased in what looks like a bullet I would’ve thought you off your rocker. I was through and through and fountain pen guy. As I said back in February I despised pencils. Then I chose them to be my Lenten sacrifice. Unfortunately, from a sacrifice perspective, by the time Easter came I had begun to enjoy using pencils. After those 40 days I reviewed the Blackwing 602 and didn’t consider it reverenced. I think if I were to review it again my position would change. Over the course of the last 8 months I found myself purchasing single pencils at art supply stores and off the internet. I even subscribed to receive a dozen special edition Blackwing pencils four times a year. Special edition pencils, really? I now enjoy using pencils. The smell of cedar can just be sensed by my weak olfactory sensors. it's such an enjoyable experience to sharpen a pencil. That statement itself is new to me; it feels weird to write it. Part of what helped me is this stationary and pencil community. the Erasable Podcast Facebook Group has been a blast. I’m not as deep into pencildom as I am in pendom, so I’m still learning. To say thank you to you my readers and to the community, I have a giveaway courtesy of my friends at Metalshop CT and Nock Co. I know it seems like all I'm doing is giveaways but I promise, posts are on the way. I've chosen colors than remind me of fall. Make a comment on the blog. CHECK BACK ON THE BLOG ON JANUARY 1 at NOON CST to find out if you won. If you did email me through the letter button on the top right of the site. You have 4 days to respond before I choose another winner.